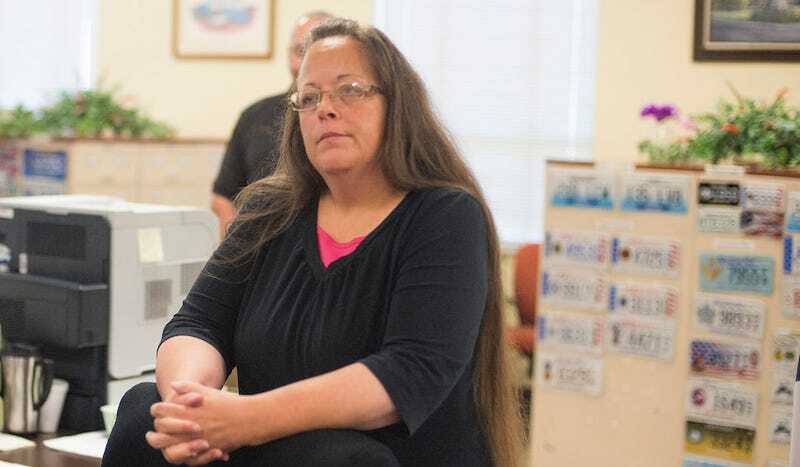 Kim Davis has finally been punished for her refusal to uphold laws that grant others civil rights. If she wants to get out of jail anytime soon, she should probably fire her lawyer from Liberty Counsel, because he just unironically compared her to a Jew being persecuted by Nazis. Speaking to Crossfire, Mat Staver, of Liberty Counsel, disagreed with the decision of Judge David Bunning (who was, according to Right Wing Watch, appointed by Bush) to jail Davis for her refusal to uphold the Constitution and do her job. But Staver wasn’t sure that people would understand Davis’s plight unless he made it really clear for them. That’s why he chose to compare Davis’s bigotry to the millions of Jews killed by the Nazis, conveniently ignoring the fact that Davis is the one in power here, and she’s the one doing all the persecuting in the name of her religious freedom. What’s worse? The fact that this lawyer doesn’t seem to understand that Davis’ liberties are not being stripped or the fact that he truly believes that Kim Davis spending a few nights in jail while Huckabee tweets his support at her is equivalent to the slaughter of millions? And do you think Davis believes this as well?